The world is not a merry place, it will affect us some way or the other. It will break up and mold us in ways we do not yet know. But the best part is, while it might break us, we will definitely grow stronger. Our brokenness will gain a strength that the world cannot break any further. Writing is about living life and translating it on paper. If you have not lived life, then you have no substance to write about. 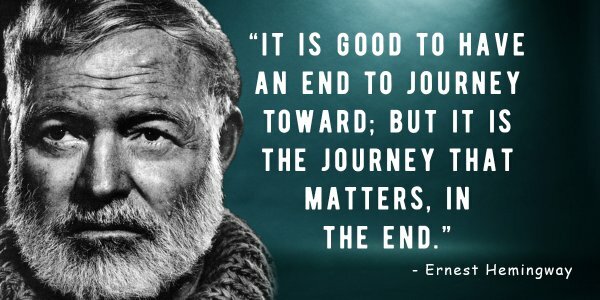 As Hemingway himself lived life to the fullest, his writings are a treasure of both adventure and emotions. It’s only by living a life that he was able to enrich his writing. This goes without saying – how will you know someone cannot be trusted unless you give them the chance. Yes, we fear trusting others, because maybe our trust has been broken before, but then it was by trusting them that you understood that they cannot be trusted. Should you put the same label on someone you don’t know yet? We often try to escape from who we are. We are afraid of something and so the best way to deal with the situation is to leave everything and change cities or countries. But we can’t escape ourselves – it is only by confronting who we are that we can actually and truly solve whatever is making us afraid. That’s the beauty of love. If you actually have loved someone deeply and they pass away before you, then there is nothing more painful than that. It makes you terribly lonely. It’s impossible to say whether it is a happy ending or a sad one, since ‘It is better to have loved and lost than never to have loved at all’. The world is going to test you again and again. Sometimes, it’s going to put you in the corner and try to break every bit of you. But the real test lies in lasting through it. Continue to survive, continue to remain strong. and the world will not be able to do anything to you. Intelligent people see the world differently. They are rarely social and they fail to find happiness in many things where normal people might get the necessary pleasure from. They know what suffering is – and somehow, they fail to put happiness in that equation. We tend to promise a lot of things when we are drunk. We have our tongues lose. But when we actually start delivering on those promises in a sober state, then we can understand our foolishness. We often worry about what we do not have and what we could have had. Jealousy strikes, and we remain blind to what is already there with us. Think about what we already have and how we can achieve greatness using those. Whenever we try to go for a journey, even in the journey of life, we are always thinking of the destination. We are supposed to reach somewhere and that remains in our mind. But it is not the end that matters – it is actually the entire course of the journey that will enrich your life. This may look grim, but this is such an important lesson. Every person will die – but what they leave behind matters. How you live will decide what kind of legacy you leave behind. Soldiers live a hard life and may become martyrs, and we remember them for both their life and death – their contribution towards protecting us. However, we don’t remember everyone who dies, do we? So, do something for someone who will lovingly remember you post-death. People can limit your happiness. They can spoil your day and make you feel worse about everything. But then, there are certain people who are a wave of optimism. They bring newness in your life and help you grow. They make you do what spring does to flowers – bloom! Hemingway had his treasure of wisdom which he had passed down to all of us through his writings. Thing is: are we capable of accepting it and infusing it in our lives?
? Stray Dog Adopted By Gas Station Saves Attendant During Robbery [Video] Recycling Is Not Enough. Zero-Packaging Stores Show We Can Kick Our Plastic Addiction ?